Pump for Pipette is a fast release pipetting device for precise pipetting & zip quick emptying. The Knurled thumb wheel can be rotated to draw up or dispense liquids while the releaser may be pushed in for zip-quick emptying. The moulded chuck has a silicon rubber collet inside to hold various pipettes of standard sizes. It resist acids & alkaies and can be easily disassembled for thorough cleaning. 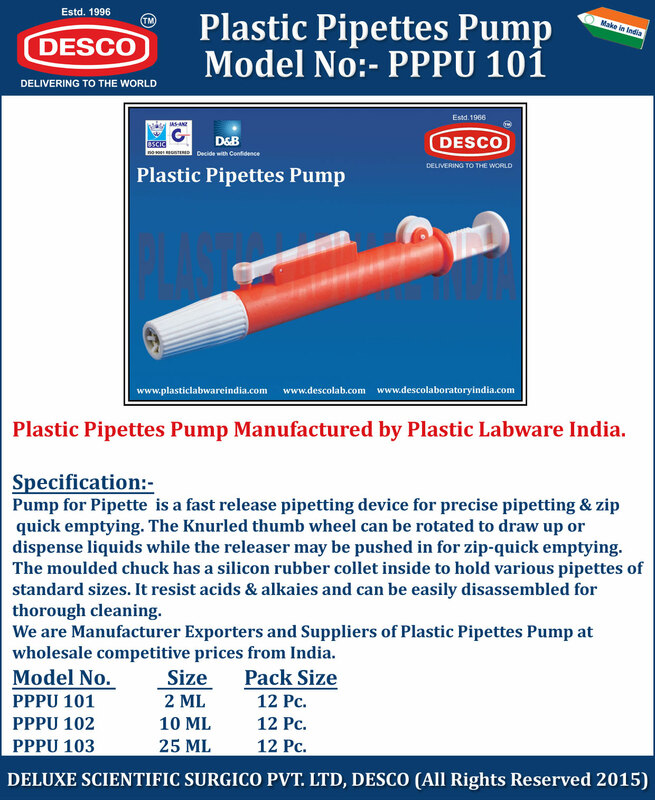 We are Manufacturer Exporters and Suppliers of Plastic Pipettes Pump at wholesale competitive prices from India. PPPU 101 2 ML 12 Pc. PPPU 102 10 ML 12 Pc. PPPU 103 25 ML 12 Pc.